As far as Government Banking Jobs are considered, The IBPS Probationary Officer holds the most prestigious and highly respectable position in banking bodies. A probationary officer of any bank has to undergo through the training session of 1 year or 2 years and after successful completion of training period, he gets promoted on the position of Assistant Manager. Now-a-days, Bank PO as a career is the 'much preferred career option' for young graduates and IBPS Recruitment Exam is the gateway to this job destination. However, becoming an IBPS PO is not that easy as the difficulty level of this exam increases every year. Prepare for IBPS PO 2019 with Sample Papers designed for banking exams - Register Now! If we talk about IBPS PO Exam 2019, around 4000+ vacant seats will be made available. So, the candidates need to prepare so brilliantly that they can beat up their competitors and notch up the top scores in the Bank PO Exam. IBPS PO Interview Preparation - Avoid Rejection in the Final Round! Get complete IBPS PO Interview Topics explained in length in the series of banking interview preparation articles. Why Bank PO is a Good Career Option? Banking as a career provides many chances for employment and promotion as well. Before making up your mind for Bank PO position, you should be very well aware of the PO Job Position and Its Benefits. Below we have listed all the benefits in a precise form. Please have a look! Easy Loan Sanction at Lower Interest Rates. Get Promoted with Departmental and Flagship Exams (Read JAIIB and CAIIB Exams). To know more about Probationary Officer, please follow the link - IBPS Bank PO Job Profile. IBPS PO Recruitment Procedure | How to become an IBPS PO ? Well! IBPS PO Exam consists of 3 stages and these are Preliminary Exam, Mains Exam, and Personality Test/Interview. In order to qualify for IBPS PO, aspirants are required to pass all the three rounds with good scores. Preliminary Exam - IBPS PO 2019 Prelims is the very first step of the recruitment process. If a candidate qualifies this phase, only then he/she'll be able to appear in the next round. The Prelims Exam is qualifying in nature. After the declaration of IBPS PO Prelims Result, the admit cards for Mains Exam are released for the qualified candidates. Mains Exam - In IBPS PO Mains phase, candidates are required to score as much as they can. The overall marks score in IBPS PO Mains 2019 will be considered while merit listing for interview. As per the guidelines, IBPS Mains Scores hold 80% weightage in the recruitment process. Interview - The IBPS PO Mains qualified candidates are eligible to appear in Interview Sessions. The candidates are assessed personally by the interviewers and rated accordingly. Final Result - The Final result is declared on the basis of candidates combined performance in IBPS PO Mains and Interview Rounds. Provisional Allotment - After completion of Result Declaration procedure, the official website releases the list of finalized candidates along with their allotted banks. The provisional allotment of IBPS Banks is done on the basis of candidates' preferences which are made at the time of applying online. After the provisional allotment, only the respective banks will be responsible to intimate candidates about their joining dates and procedure. So, this was the complete process through which a candidate can become a Probationary Officer in any of the reputed Indian Banks. The first thing which candidates should have a look on before starting their Bank PO Exam Preparation is to review IBPS PO Exam Syllabus. To remove your confusion regarding important topics and exam conveners' expectations for the course, Eduncle provides prescribed IBPS PO Syllabus 2019. However, the official website of IBPS does not provide any Syllabus Portion for IBPS PO Exam but as per the Previous Years Papers Analysis, Eduncle has come up with the important topics which may come in the PO Exam 2019. Check out the IBPS PO Exam Syllabus 2019 now! Before applying for the exam, candidates must ensure whether they are eligible to appear in the exam or not? The convener body of Bank PO Recruitment Exam - IBPS has set some guidelines for each and every applicant in the concern of some important criterion like - Age, Educational Qualification & Nationality. Graduation Degree: The eligibility criteria for the IBPS PO Exam is a graduation degree (BA, BCom, BSc, B.Tech or as such) in any discipline from a University recognized by the Government of India. Percentage: Any such candidate who has received equivalent qualification which is recognized by the Central Government is also eligible to apply for this exam. There is no minimum percentage requirement for IBPS Bank PO. Subject of Nepal or Bhutan. Person of Indian Origin (PIO) who has migrated from Burma, Pakistan, Sri Lanka, Vietnam or East African countries of Zaire, Kenya, Tanzania, Uganda, Zambia, Ethiopia, Malawi, with the intention of permanently settling in India. To know more about the eligibility criteria you can visit this link - IBPS PO Eligibility Criteria. The official website of IBPS to conduct the Online Application Process from August to September 2019. If candidates have any query regarding their online applications, they can visit to the following blog - IBPS PO Online Application Form and get answers to all their queries. Photograph and Signature scanned in the prescribed size. Bank Account with Debit or Credit Card to pay the Application Fee. Reserved and PwD – 100 Rs. Scanned declaration as given on the official notification. IBPS PO Exam Preparation Tips and Study Plan! Prepare a daily schedule to accomplish your preparation goals and stick to it! Prepare a schedule, divide the topics to be learned, assign a particular time duration to topic and also set time for revision. Follow this schedule strictly. Spend almost 7-8 hours daily on your studies and take each section one by one. For better time management, you can take General Awareness Section in the morning hours and save your noon time for practicing Math questions. For smart study, you can take help of short tricks and formulas to solve the questions. To make your practice more effective, take help of IBPS PO Previous Years Question Papers . This is the smartest way to practice for the exam as you get to know the exact format of questions that come in the question paper. IBPS General Awareness Section consists most of the questions from Current Affairs and Banking Awareness. So Read them on daily basis! Also visit - Important Banking Terms! To become stronger in IBPS English, you can start reading English Newspapers and Novels, watch English Movies and TV Shows. Also make it a habit to speak in English while talking with your friends or family. IBPS Computer Knowledge Section consists questions from basic computer terms and terminologies. So focus on gaining the basic computer knowledge! You can also take help of online learning! You may check the IBPS PO Analysis to get an idea about the exam pattern and difficulty level of the questions. Eduncle which is India's Leading Online Learning Platform, provides IBPS aspirants a complete guidance to prepare well, through its video lectures and other helpful online study material. It is mandatory for each candidate to carry their hall tickets in exam hall otherwise they will not be permitted to enter the examination hall and appear for the exam. At Eduncle, all the latest notifications related to IBPS PO Recruitment 2019, is updated first, so that the readers can download their IBPS PO Prelims and Mains Admit Cards. Similarly, Official Website releases IBPS PO Call Letter for shortlisted candidates for the Interview Round. These call letters must be carried at the time of Interview. IBPS PO Admit Card 2019 and Call Letter - Download Here! IBPS PO Result 2019 for Prelims and Main Exam will be declared once the exam will be conducted. You can check the step-by-step procedure to check your result for Prelims as well as for Main Exam here - IBPS PO Result 2019. IBPS PO Interview Preparation 2018 | What to Study for Interview? The Common Interview Process is the final stage of IBPS Recruitment. Based on the score obtained in Mains, the official authorities shortlist the talented and deserving candidates for Interview Round. Earlier in 2011, the 27 PSB’s used to conduct their separate Interview Processes for the final selection of candidates shortlisted through CWE rounds. But later in 2012, IBPS itself has introduced the scheme of Common Interview Process to filter out the suitable candidates for the positions like – Probationary Officer, Clerk & Specialist Officer. The Interview process contains total 100 marks. The minimum qualifying marks in interview will not be less than 40% for General Candidates and 35% for SC/ST/OBC/PWD candidates. And the selection ratio of written exam & interview round is 80:20. Prepare yourself for the actual Interview mentally. There will be 4-10 panelist in the interview. All these Interviewers are experienced banking sector officers. Practice to answer the questions in front of mirror or get help from friends to boost your confident by creating a mock interview environment. Be well dressed & confident on the day of IBPS PO Interview. Your body language must be calm & composed. Stay well-informed about current affairs, banking terms & most importantly, your own details. Most of the interview questions are geared towards testing your self-confidence & zeal to work in the respective bank. The selection ratio of written exam & interview round is 80:20. For more Interview Tips, please visit - 7 Tips you should consider while preparing for Bank Interviews. IBPS is not responsible about candidates' joining. After Result Declaration, the selected candidates will get an email from IBPS mentioning the allotted banks. The allotted Banks will send an email (within 10 days of result declaration) to selected candidates regarding joining date, procedure and other relevant information. # The bank allotment is done as per Candidates' Preferences. The initiation letter sent by allotted bank will describe candidate's appointment or joining details in which the joining date on which candidates will have to report to the bank for training will be mentioned. The joining date will be given within 6 months of Result Declaration. The candidates are required to carry documents & certificates specified in intimation letter at the time of joining. If the candidate has to undergo any medical tests or similar exams, the letter will detail the same as well. All the candidates will have to appear in Training Programs of 10-15 days before joining as a PO in the concerned bank. # The training will be conducted by the allotted bank in their respective training center. After successfully completing their training, candidates are absorbed in the bank as Probationary Officers (JMG Scale-I) and posted in branches of the bank across India. After successful completion of Provisional Allotment Process by IBPS, the allotted banks notify candidates about their joining details and the formalities, they have to fulfill before joining. The provisional allotment does not mean being finally placed at the post of Probationary Officer. It is subject to the candidate fulfilling the criteria of Allotted Bank and identity verification as per Allotted Bank. The finalized candidates are required to submit a set of some important documents at the time of joining in the bank. If it is found that the candidate does not satisfy the eligibility criteria his/her candidature/ chance to work in the Allotted Bank will be cancelled. So this document verification stage is very important because if the bank authorities found that any document is missed or containing wrong information then the employment of any candidate will be cancelled. 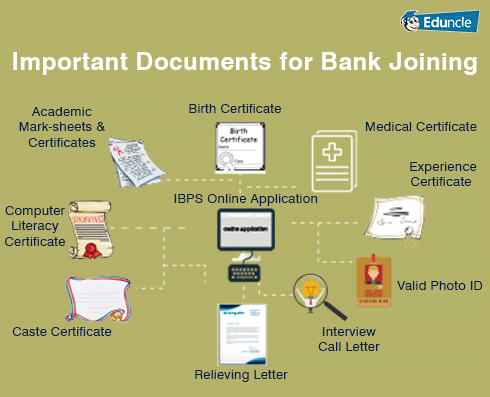 You can check the list of all the required documents here - IBPS PO Important documents for Joining in Banks. As you prepare to ace IBPS PO 2019 Exam and give it your best shot, we recommend you to go through our Bank PO Exam Preparation Video Lectures to make a bang on impression and crack the exam in 1st attempt. You can watch these videos by subscribing our YouTube Channel or you can Register on Eduncle. Also as a part of your Bank PO Exam Preparation, you need to solve tons of brain teasing questions on a routine basis. You can take mock tests to improve your speed. We provide daily Reasoning, Mathematics and English Quizzes on our Facebook Page to help you get a grip over these subjects. With this, we have provided you every essential thing to clear IBPS PO Exam. IBPS PO Bank Job is for those who diligently prepare for it. It is one of the toughest recruitment exams in India, so start early and get ahead of your competitors!